"Vassal of his Catholic majesty and interpreter of languages in the places of Oran" (so styled by himself); died Sept. 19, 1666. He was the fifth in succession of the Cansino family to hold the office of royal interpreter. Upon the death of his brother Aaron in 1633, the office was given by King Philip IV. 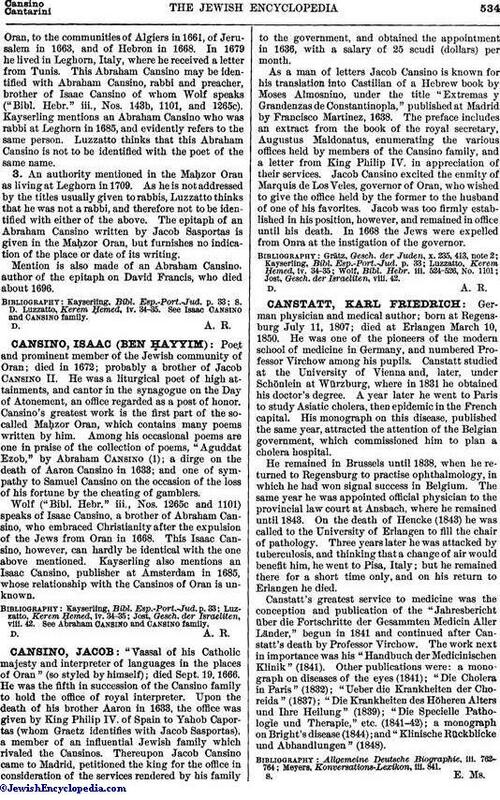 of Spain to Yahob Caportas (whom Graetz identifies with Jacob Sasportas), a member of an influential Jewish family which rivaled the Cansinos. Thereupon Jacob Cansino came to Madrid, petitioned the king for the office in consideration of the services rendered by his family to the government, and obtained the appointment in 1636, with a salary of 25 scudi (dollars) per month. As a man of letters Jacob Cansino is known for his translation into Castilian of a Hebrew book by Moses Almosnino, under the title "Extremas y Grandenzas de Constantinopla," published at Madrid by Francisco Martinez, 1638. The preface includes an extract from the book of the royal secretary, Augustus Maldonatus, enumerating the various offices held by members of the Cansino family, and a letter from King Philip IV. in appreciation of their services. Jacob Cansino excited the enmity of Marquis de Los Veles, governor of Oran, who wished to give the office held by the former to the husband of one of his favorites. Jacob was too firmly established in his position, however, and remained in office until his death. In 1668 the Jews were expelled from Onra at the instigation of the governor.